Brett, who became the Royals vice president of baseball operations after his retirement in 1993, played his entire 21-year baseball career for the Kansas City Royals. His 3,154 career hits are the most by any third baseman in major league history and 16th all-time. Brett is one of four players in MLB history to accumulate 3,000 hits, 300 home runs, and a career .300 batting average (the others being Hank Aaron, Willie Mays, and Stan Musial). He was inducted into the Baseball Hall of Fame in 1999 on the first ballot. To date, Brett is the only player in MLB history to win a batting title in three different decades. 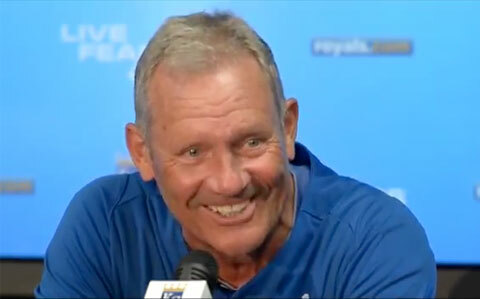 Watch the following video where George Brett talks about the “Pine Tar Game” against the New York Yankees that was played 30 years ago on July 24, 1983. Playing Field Promotions is a booking agent for motivational sports speakers and celebrities. If you would like to book athletes like George Brett for a speaking engagement, autograph signing, guest appearance, product endorsement, charity fundraiser or corporate event, contact our booking agents for appearance and speaker fees or call 1.800.966.1380.